This model seamlessly converts analogue to digital signal, making it perfect for recording your favourite vinyl. You can archive your vinyl collection digitally thanks to the USB port. Earn 519 loyalty points when you order this item. Pro-Ject Phono Box DS2 USB Phono Stage delivers the ideal solution for recording vinyl in an easy yet greatly effective way. This phono preamplifier demonstrates MM/MC cartridges with analogue, digital optical and a convenient USB output. Its stylish design puts it firmly in the DS2 family. This elegant phono stage is founded on a high-calibre passive/active ultra linear phono equalisation. MM and MC capability, as well as large variable impedance and capacitance settings, pair with any cartridge, to give the finest class of performance. Two individual phono inputs let you use two distinct turntables or tonearm/cartridge mixtures with different sound traits to flawlessly match your music preference. An ultra low noise and jitter free A/D converter moves the analogue signal into a high-resolution digital format (PCM up to 192kHz or DSD 128). Via its USB output, you can record your vinyl on any PC. The item also has an analogue line input to digitise other analogue sources. 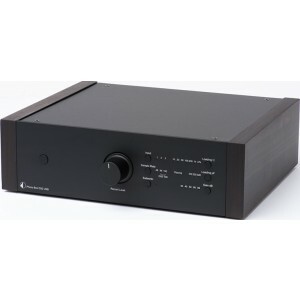 It also shows a standard line output to connect the unit to your hi-fi system for added connectivity. The Phono Box DS2 USB is made in an elegant structure constructed from aluminium and metal, which has a sleek functional look while also evading the negative influence of automatic or electromagnetic resonance.